The word “oil” comes from “olive”, which in turn derives from “superior”. » Intro » What is it? » How is it made? » What is it used for? » What is its history? Olive oil cares magnificently for skin and hair, and is also useful for some household cleaning jobs. While it is not cheap compared to other oils for culinary uses, it is very cheap in comparison to skin care products and the other products it replaces here, and is generally used in small quantities. As you won’t be diluting it with by-products of the petrochemical industry (as most bought “beauty” products have been), you’ll need to use less to achieve more. For household cleaning purposes, any vegetable oil will suffice and be much cheaper, but for skin and hair olive oil is what you are after. Olive oil is the oil extracted from the fruit of the olive tree (Olea europaea). It contains mainly mono-unsaturated fats (notably oleic acid), which are linked to lowering risk of heart disease. It is also a natural plant source of squalene. Squalene (often obtained from shark liver oil) enables olive oil to penetrate the skin easily without feeling oily, stimulates the immune system (it is added to some vaccines) and helps to protect people from cancer. It contains sterols (which help reduce cholesterol) and potent antioxidants tyrosol and hydrotyrosol (believed to be one of the most powerful antioxidants). It is also a rich source of vitamin E and other vitamins. Olive oil is a wonderfully simple oil that, because it comes from a fruit, not a grain or seed, requires only mechanical extraction, no heating or chemical reactions. This keeps its beneficial nutrients and compounds intact, and requires less energy. The olive fruit is first ground into a paste. The paste is then spread onto fibre disks which are stacked and pressed. The resulting liquid is then separated into the oil and the remaining vegetal water. Traditionally the oil was allowed to separate by gravity. Now centrifuges spin the liquid to separate it faster and more accurately. The pulp left after pressing still has an oil content (5-8% of the oil) which can be retrieved using solvents. (This is how most other edible oils such as sunflower or canola are extracted). It is still olive oil but must be labelled as olive pomace oil to distinguish it from pressed olive oil. It has a more neutral taste and requires refining if used for human consumption. However it has a very similar make-up to virgin olive oil and has the same health benefits when cooked. Most olive oil (90%) comes from the Mediterranean region, with Spain being the biggest producer. Olive oil forms a vital part of the Mediterranean diet, both historically and today. It is widely believed to hold the secret for the lower rates of coronary heart disease in the region, and is now being used increasingly around the world. There are many health benefits to consuming olive oil – it lowers cholesterol, blood sugar and blood pressure, promotes a healthy balance between omega-3 and omega-6 fats and protects against cancer and heart disease. Olive oil must be protected from heat, light and air and is at its most beneficial when freshly pressed. If it is exposed or allowed to become old, oxidation will produce toxins and the oil will turn rancid. 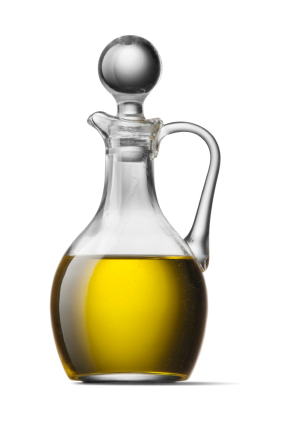 Virgin olive oil is best added to food gently warmed or unheated. It should not be heated above 177°C (350°C) as the unrefined particles get burned, becoming a health hazard; for higher temperatures it is best to used refined olive oil (or better still, coconut oil). Olive oil is awash with skin benefits, being full of vitamin E and other antioxidants; it is sebum regulating, healing and anti-aging. It also helps protect the skin from cancer and the damaging effects of the sun, not by blocking the sun’s rays but by boosting the skin’s own defences and recovery. Olive oil is antiseptic and has skin healing properties. Many of the compounds naturally present in olive oil are added to the most expensive cosmetics. Have a look at the many uses for olive oil in caring for your hair and body. Olive oil is also used in soap-making and pharmaceuticals, and is a traditional fuel for oil lamps. Its abilities to care and protect can also extend to surfaces in your home such as wood and leather. See here for more information, benefits and uses of olive oil. Neolithic people were gathering wild olives as early as the 8,000 BC. Oil production had begun by 4,000 BC, with the oldest amphorae dating from 3,500 BC. Olive oil was important to the Egyptians, who were importing it before 2,000 BC. Ancient Greek athletes ritually rubbed it all over their bodies, and it has been produced and used widely throughout the Mediterranean for a variety of purposes ranging from magic to lamp-fuel. It was traditionally considered a sign of wealth and power, as well a necessity for life. Homer called it liquid gold. Legend holds that the people of Athens chose the olive tree, gift of Athena, over a spring of salt water, gift of Poseidon, which is how Athens was named. The importance and antiquity of olive oil can be seen by the fact that the word for oil comes from “olive”, which is itself derived from the word for “superior”.